When you experience a dental emergency, things tend to become a bit overwhelming and worrisome. Instead of becoming stressed about where you should go to seek treatment, you can contact our referral service. 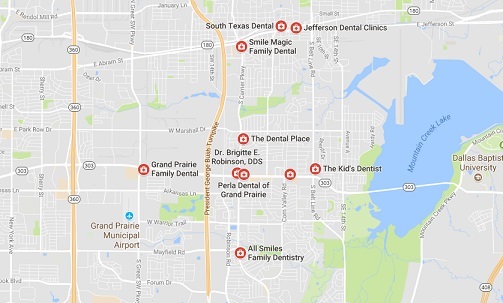 We have done the work for you and have created a detailed list of emergency dentists in Grand Prairie, Texas who are available when your emergency rises. Emergency Dentists USA was there when I needed it most! Their employees are great and they can find dentists near you and help you find an appointment. Grand Prairie, Texas offers a few different dental treatment options for emergency services when you are in a dental crisis. An after hours dental clinic is a regular dental office, but they provide services beyond typical operating hours. Some are open as late as 7 pm on the weekdays and even provide weekend hours on Saturdays for more convenience. If you are experiencing an emergency, this is a good solution for treatment as it allows you to be seen on a more flexible schedule. For those who work during the week and require later weekday or weekend appointments, these clinics provide the ability to schedule an appointment that is more suitable to your schedule. Walk in dental clinics offer more flexibility of being seen without a prior appointment. This option also offers a suitable solution if you find yourself in need of emergency dental treatment and all other offices are booked with appointments. 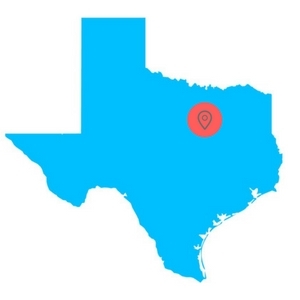 Here you will find yourself a detailed listing of emergency dentists in Grand Prairie, Texas. Instead of spending valuable time looking through various dental listings and contacting everyone on the list to find out who is open, you can instead get all the information you need right here. Description: Don’t let your visit to the land of open skies and starry nights get ruined with emergency dental pain! One easy and painless call to our 24-7 referral service will have you happily going about your business again pain-free. Description: This dental emergency clinic in Grand Prairie, Texas offers flexible appointments and make your dental care an affordable situation given their latitude with financing planning. You can go online to explore your dental options and get an appointment underway or call if you suffer from any form of dentistry malady requiring the assistance of a trained and licensed dentist. Description: Active Dental provides a wide variety of dental services and procedures to address all of their patients’ dental health needs. By combining quality patient care with up-to-date technology, they are able to treat patients of all ages in a comfortable and relaxing setting. Description: This practice led by Cecil F. George makes it a point to be open late hours due to emergencies and is led by staff that knows emergencies happen during evening hours frequently when patients may need the most attention. They will get to know you and take the time to really listen to your needs and desires. Description: Dr. Joseph Anwah is an experienced pediatric dentist who works wonderfully with children. The staff at Dr. Joe’s office is well equipped to handle the sensitive nature of a child at the dentist. They also offer weekend appointments on Saturdays twice a month to allow for greater flexibility for working parents. Evening appointments are available Monday through Thursday until 7 pm as well. Preparing for a Grand Prairie, Texas emergency dental appointment is very similar to a new patient appointment. Because the dentist is unfamiliar with you and your dental history, it would be beneficial to bring along any vital medical or dental records you may have. If you have a scheduled appointment, remember to arrive at least 15 minutes before it begins to fill out any necessary paperwork you may have. This can help to speed along the progress of your visit. Because those in the office are not familiar with you, it is a good idea to inform them of any allergies to medications you may have. You don’t want to end up with a surprise adverse reaction, as this could delay your healing time. If you are experiencing any of the symptoms below, it is likely that you need to visit an emergency dentist ASAP. All of these common emergencies can leave you in a lot of pain. Getting it fixed quickly will be the key to avoiding further problems with your teeth. A chipped or broken tooth is one dental emergency that must be handled in a timely manner. To help alleviate any discomfort or pain, you can apply a cold ice pack to the outside of the affected region. This can help to reduce any swelling. Covering the portion of the broken or chipped tooth with dental cement can help as a temporary solution. It is vital that you see a Grand Prairie emergency dentist immediately for the proper care and treatment. A knocked out tooth can definitely be worrisome and a reason to contact an emergency dentist. There are a few things you can do to help preserve the tooth and increase your odds of saving it. Never pick up the tooth by the root, this can only damage it further. Instead, pick it up by the crown, if it is dirty rinse it gently with milk or water, never scrub it. Try to reposition the tooth back into the socket to help keep it moist. Make sure you don’t try to jam it in there hard, as this can cause additional damage as well. If you are unable to put it back in place, putting it in a small container of milk until you are able to see a Grand Prairie emergency dentist is your next best option. 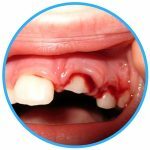 The nature of the tooth trauma as well as the length of time since the injury occurred will all factor into the healing of a dental trauma. This is why it is very important to see a Grand Prairie emergency dentist immediately when you experience any trauma to the mouth. Timely treatment can help to increase your chances at a much faster and comfortable healing time. Dentists always work to prevent any damage to your natural teeth. They love to help you keep your teeth happy and healthy for a lifetime, but sometimes there are circumstances that come up that cause a dentist to recommend an emergency tooth extraction. When a tooth is unable to be fixed due to an accident or severe decay, an emergency extraction may be the best route. Your teeth are supported by bone. 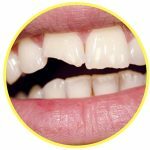 When enough damage is done to the bone structure due to periodontal disease, an emergency extraction may also be necessary. Severe abscesses that don’t respond to a root canal treatment may also require extraction to help prevent the spread of infection in the mouth. Having an emergency extraction may sound scary, but with today’s procedure methods and anesthesia, there is nothing to worry about. It is common for the full healing process to take anywhere from 3 to 6 months. However, you will notice initial healing within 1 to 2 weeks after the procedure. When a dental emergency strikes, it can be rather confusing on where to seek out treatment. Most people do not realize that there are emergency dentists in Grand Prairie, Texas available to help in their time of need. This is why more often than not, many people rush off immediately to their local emergency room. However, many times this is not always the best choice. Dental emergencies should be handled in a timely manner by those experienced in conditions of the teeth and mouth. Some severe soft tissue injuries and dental abscesses may be best treated at an emergency room. A Grand Prairie emergency dentist can help advise you on if this is certain in your case or not. Additionally, if you are someone who also suffers from a chronic condition or immune system illness, it might be in your best interest to go to your local emergency room so that they can help choose the best treatment route for all conditions. Emergencies aren’t something we’re every prepared for, but when they do come you want to have comfort in knowing you can get the right treatment. When you experience a dental emergency, instead of running off to the first nearby hospital, it might be best to check out our referral service to find out which dentists are available to suit your needs. Don’t forget with every new provider, you will want to check out their certification through your Texas Dental Society, or Grand Prairie Dental Society. This can help to ensure you are being seen by a qualified dental professional.